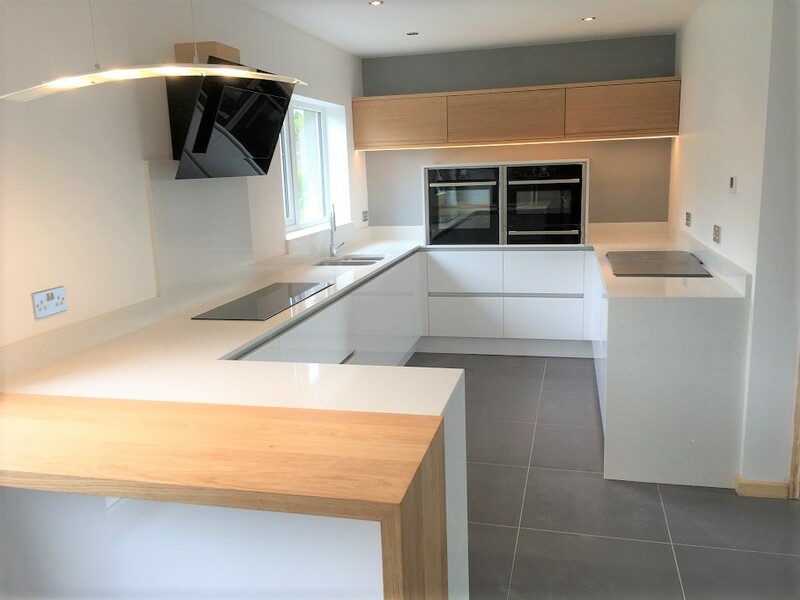 For this kitchen in Torquay we combined the cool, crisp looks of the white gloss doors and industrial aluminium rail system with the warmth and texture of the Malmo Oak wall units and solid Oak breakfast bar. Rather than install the oven, microwave and warming drawer in tall units, which would dominate the room, we custom-built mid height units, with the worktop wrapped over the top. This provided the practicality of the higher ovens, but kept the wall space free for the feature gas-lift Oak wall units. The full-stave prime Oak breakfast bar and quartz worktop ends were mitred and returned to the floor, creating a striking modern look. Are you looking to renew your kitchen?